Georgia Republican gubernatorial candidate Brian Kemp speaks with supporters early Nov. 7, 2018, after a long election night in Athens, Ga.
ATLANTA — Republican Brian Kemp has resigned as Georgia secretary of state after declaring victory in the race for governor over Democrat Stacey Abrams. The secretary of state's office issued a statement saying Kemp's resignation was effective at 11:59 a.m. Thursday. His departure comes as Abrams refuses to concede until every vote is counted, including about 22,000 outstanding provisional ballots. Abrams campaign says that it's too soon for Kemp to declare victory and that it is taking legal action to "ensure that every single vote cast by Georgia’s citizens is counted." "We know our opponent has had the secretary of state's office declare he is the winner. We are here to say we don't accept that," said Lauren Groh-Wargo, Abrams' campaign manager. Abrams' legal team announced at a press conference Thursday that it was filing a lawsuit against Dougherty County election officials requesting that late absentee ballots still be counted. Kurt Kastorf, a member of the legal team, said a large number of voters requested mail ballots that were delayed because of an issue with the ballots themselves and then Hurricane Michael. Kastorf said many Dougherty County voters were not given enough time to review, complete and submit their ballots. Attorneys for Abrams also claim there are hundreds of Georgia voters who cast absentee ballots, including several college students, but there is no confirmation of it being received or counted on the state's website. Robyn A. Crittenden was appointed to serve as interim Georgia secretary of state. "We deeply appreciate Brian Kemp’s public service as secretary of state," Lorri Smith, assistant deputy secretary of state, said in a statement. "We will continue our work in this office on behalf of all Georgians." 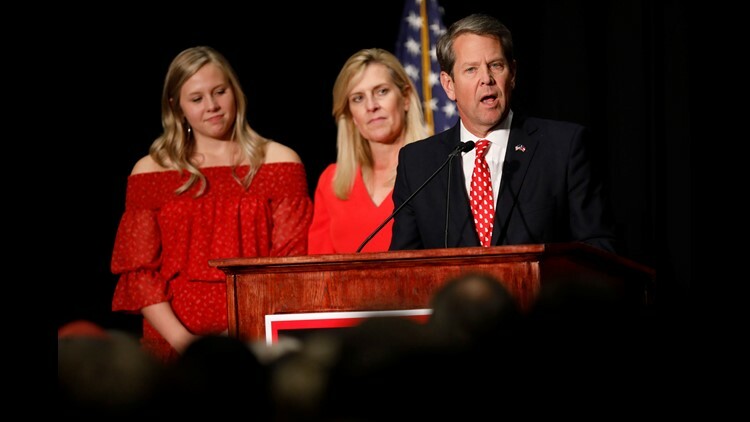 A spokesman for the Kemp campaign said that with Kemp ahead 64,000 votes, outstanding provisional and overseas ballots would not make a difference. Kemp supporters have started celebrating on social media, including Georgia Gov. Nathan Deal who posted a tweeted saying: "My congratulations to Gov.-elect @BrianKempGA. He and his opponent both ran passionate campaigns with very different visions about how to keep Georgia on this path of prosperity, and I believe the voters of Georgia made the correct decision in electing Brian." Critics have been calling on Kemp to resign for months, saying his position as state elections chief was a conflict of interest with his candidacy. NAACP President Derrick Johnson released a statement Thursday saying it was "unfortunate" that Kemp didn't step down months ago to ensure a fair election. Groh-Wargo said the Abrams campaign was blindsided by Kemp's claim of victory, saying there are at least 25,000 provisional and mail-in ballots that remain uncounted. She said they were unsure of how many absentee ballots remain, but the Georgia secretary of state’s office said Wednesday afternoon that fewer than 3,000 “non-provisional” ballots were outstanding. Clarke, Fulton, Hall and Gwinnett counties completed their absentee ballot tabulations Wednesday. Cobb and Chatham were expected to also finish their counts by the end of Wednesday. According to the statement, county officials reported fewer than 22,000 provisional ballots cast statewide. Abrams campaign said an additional 23,783 votes would push the race into recount threshold, and 25,632 more votes would force the race into a runoff.